TORONTO - Two "senior statesmen" of the Canadian roots music scene have just returned from a western tour and will be celebrating the release of their brand new CDs on Sunday, November 10, at the Full of Beans Coffee House on Dundas Street west of Dovercourt. It's been nearly 50 years since they first recorded together at RCA studios in Montreal. Allan Fraser's "Super Moon" is the culmination of a musical journey that started with Fraser & DeBolt in the 70s and Brian Blain's "New Folk Blues 2.0" is an "upgrade" of his 2011 album with renowned bassist George Koller. Brian went back into the studio and "sweetened" the live recording with horn players Alison Young and Colleen Allen, drummer Michelle Josef, violinist Drew Jurecka, Australian organist Clayton Doley and some sweet slide guitar from Harry Manx. Brian is offering a free upgrade to anyone who bought Version 1 of New Folk Blues. Father and son are planning another CD launch at an electronic music venue and Brian will also be doing launch events with his his "bluesgrass" outfit and his horn band, The Blainettes. The two Columbia albums released by Fraser and DeBolt in the early 70s are still considered quite influential and Fraser's song, "Dance Hall Girls", is a classic wherever pickers gather. It has been recorded by dozens of artists, most recently John Oates of Hall & Oates. Fraser's new album, Super Moon, is already finding interest, both from fans of Fraser and DeBolt and those newly introduced to songs and performances of this great Canadian singer-songwriter. Brian Blain produced the last Fraser & DeBolt album and toured with them occasionally. Over the last 50 years, Brian and Allan would get together to play and when Allan moved to Toronto earlier this year, they renewed their musical collaboration. "We came up together," says Brian "and when I hear recordings we made back then, our guitar styles are so similar I'm hard pressed to know who's playing what." One late night last February in a hotel room at the Folk Alliance conference, Home Routes founder Mitch Podolak hatched the idea of getting Allan, one of his favourite songwriters, back on the road along with his oldest musical compadre, Brian Blain. Six months later, Brian and Allan were on a two-week tour of Manitoba and Saskatchewan supporting the releases of their two new CDs, both mixed and mastered by Quentin Meek in the Eastern Townships. Brian and Allan will be sharing stories and performing tunes from their respective new CDs at Full of Beans Roastery, 1348 Dundas Street west of Dovercourt, on Sunday, November 10, 2013 from 1-4pm. Allan will do a set at 2pm and Brian at 3. 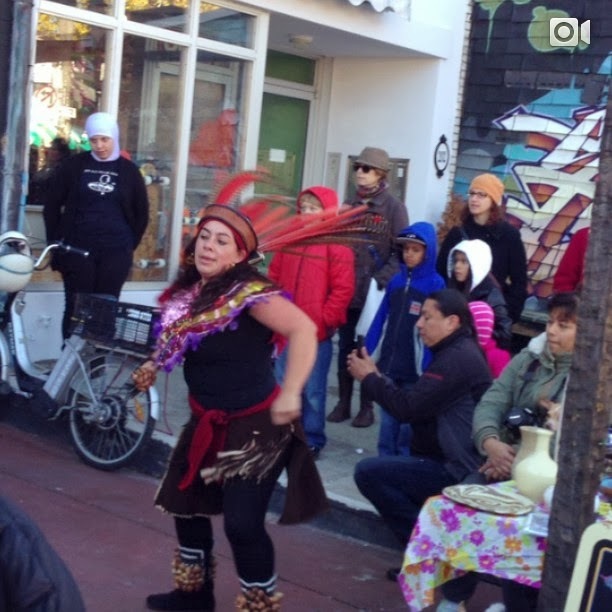 "Celebrating #dayofthedead in #kensingtonmarket #toronto"